One of the most intriguingly retarded LP's of all time is The Surfsiders Sing The Beach Boys Songbook. Little is known about this curiosity, but as far I can tell, it was one of those Beach Boys "soundalike" knockoffs peddled to unsuspecting kids back in the sixties. Kids like me–that hitched down to the E.J. Korvette's on Central Ave to pick up the latest cheapo kid-bait crap like The Beatles Story or Meet the Beetle Beats. 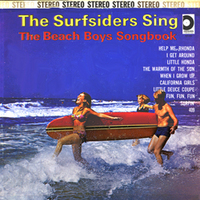 The Surfsiders Sing The Beach Boys Songbook is essentially an insane smorgasbord of Beach Boys covers like California Girls, and When I Grow Up To Be A Man, as performed by what sounds like drunken studio louts and their parcheesi playin' cronies. It's a far cry from the sun-dappled shores of Hawthorne by the sea, I can tell you that. These barbershop warblings (with a heavy dose of older white man oompah) swing along like Lawrence Welk in a speedo on a sunny day. Lotsa hoopla on this record. Somehow, the off-key harmonies and discordant horns reveal innocent qualities that lurk beneath the atonal madness. Or maybe I just don't know good from bad anymore. I don't know. The only thing that I can be sure of these days, is that I know that I like The Surfsiders. On occasion, I've played selections from The Surfsiders Sing The Beach Boys Songbook (409 and Little Honda are in heavy rotation), but leave it to fellow fmu dj Gaylord Fields to bravely spin the whole freakin' thing in its entirety! Check out the show right here (Real Audio archive). I'll never forget Gaylord's telephone greeting when I called the studio during his Surfsiders fest: "Hello, WFMU. Sorry!" You know, my workplace firewall hates that 5555 ported link, but is okay with http://wfmu.org/listen.ram?show=11229&starttime=0:59:09 , and I even set the start time to the first bit of music so you don't have to search. http://wfmu.org/listen.ram?show=11229&starttime=0:57:00 if you want to hear him talk about it beforehand. Dave-aluh!!! i hate to say it but i prefer these versions to the originals. when i heard "When I Grow Up To Be A Man" on Music to Spazz By i nearly soiled myself. thanks for the post and pass the Depends! I don't know about The Surfsiders 'cause I'm a friggin' gremmie! However, Flo & Eddie's The Sanzini Brothers Return (featuring The Tibetan Memory Trick) is A O.K. in my book (playlist). WARNING: Do NOT listen to it more than twice. Just heard this from a link supplied by "Grumpy's Golden Oldies"
You know, it may be 40 years since this "record" was released, but I still don't think it's too late to throw the entire resources of the FBI at those responsible for this and tracking them down and incarcerating them for the rest of their lives. Those that have done the world a favour and are already dead and buried could have their bodies exhumed and their bones powered and scattered to the 4 winds. I Googled this title and under the link for MP3.com it said "MP3.com offers legal Surfsiders music downloads as well as all of your favorite Surfsiders music videos." Don't get excited like I did! You go to the site and there's no mention of any Surfsiders music videos, not even your least favorite ones! I used to have this LP! I found your page because I was missing the amazing doo-wop sounds. Thanks for the memories.